This hotel is 100 percent non-smoking. Connected by a covered walkway to the Hampton Roads Convention Center Embassy Suites by Hilton Hampton Hotel Convention Center - Spa is a great place to make the most of your stay. Within easy reach of some of the area*s largest corporations and most popular attractions this all-suite hotel has excellent access to I-64 and is less than 20 miles from Norfolk International Airport and the Newport News/Williamsburg International Airport. Stay connected and productive thanks to the complimentary BusinessLink Business Center or get some work done from the comfort of your spacious two-room suite. A private bedroom and separate living area featuring a sofa bed means you have the flexibility to relax with the whole family. Start every day in style with a free made-to-order breakfast. In the evening unwind with a drink and snack at the complimentary Evening Reception*. Pamper yourself with a trip to Spa Botanica. 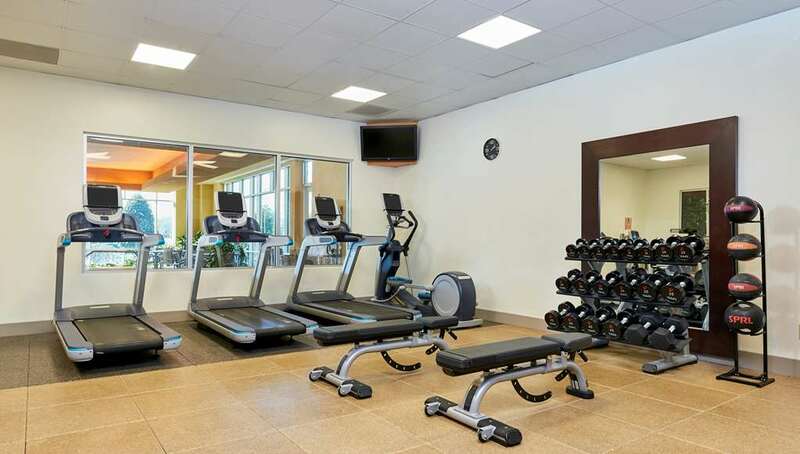 Keep active by swimming laps in the indoor pool or by utilizing the fitness center. The adjoining Hampton Road Convention Center features over 160 000 sq. ft. of conference and exhibition space making this the ideal choice as a Hampton conference hotel. Plan your wedding with the assistance of our professional staff and take advantage of our flexible space and wedding services. * Service of alcohol subject to state and local laws. Must be of legal drinking age.